The Gel & Zol combo first appeared in the original Legend of Zelda as a large droplet monster that, if you struck it with your sword, divided into two smaller fragments. They aren’t too complicated beyond that – Zols deal damage if they touch you, and the tiny Gels typically just try to latch onto you to slow you down. Zols came back in almost all of the 2D Zelda games to follow, with the three exceptions being Zelda II, Minish Cap, and Spirit Tracks. So far, they’ve been totally absent from 3D console titles – until now. In Skyward Sword, they behave in more or less the same way as their 2D counterparts. The larger Zols will move around slowly, hoping to eat or otherwise kill you (how do most enemies in the series hurt you anyway?). You’ve probably seen the screenshot depicting them as you see at right. 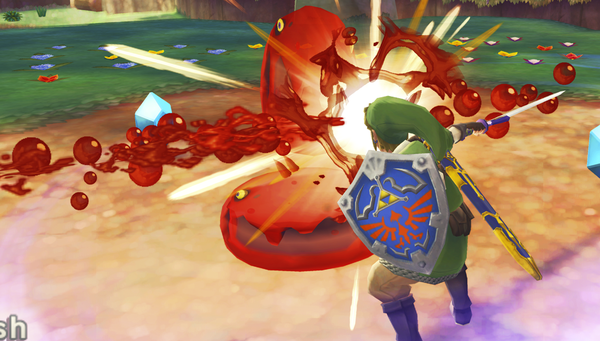 For awhile, the fan community thought they might be the new version of the ChuChus, a new enemy that’s been in almost every game since Wind Waker, but online demo footage showed that they were actually Zols when players cut through them and they split into two smaller slime creatures. The Gels also inherit their behavior from the previous games. They’ll latch onto Link and slow him down, and you’ll have to shake your controllers violently to knock them off before you can strike them down. If you take too long to kill them, they can reform into a Zol once again, forcing you to go through the process all over again. Nothing too difficult from what I can tell, but still a really nice throwback to the older games. Check out the footage below for some shots of the Gel & Zol in action (they appear at around 9:00).